A preview of this map is included in the Gallery section. Stefan Marjoram has just completed working on the stitched map. It is an enormous digital map, 42,000 x 22,000 pixels, and virtually seamless. It provides a splendid opportunity to view our villages as they were, in great detail, from the comfort of your own PC! As many of you will know Stefan lives in Saxon Street in Lower Langford and has kindly taken many of the photos that have appeared in our publications. He has also digitised many of the maps that we have been able to include on our site, which enable you to explore our local history going back nearly 300 years. In addition to his work as a creative director for Aardman Animations he is an excellent artist, and I have included a link on our links page to his web blog where you can see much of his work. He is currently working on sketches for the Bloodhound vehicle that is hoping to attempt a new land speed record! Quite a contast to photographing Langford’s ancient houses. Do take time to visit his site, and enjoy his latest remarkable contribution to our site. To see the plan, please click here, and follow the instructions to navigate the map. Please see the Gallery section for another map of historical interest showing our region dated from the John Speed atlas dated 1610. Perry Bridge is once again clearly marked, as are Wrington and Burrington. However, there is no mention of Langford on this map. John Speed (1552–1629) was a historian and cartographer, whose maps of English counties are often found framed in homes throughout the United Kingdom. He was born at Farndon, Cheshire, and went into his father’s tailoring business where he worked until he was about 50. While working in London, his knowledge of history led him into learned circles and he joined the Society of Antiquaries where his interests came to the attention of Sir Fulke Greville, who subsequently made Speed an allowance to enable him to devote his whole attention to research. As a reward for his earlier efforts, Queen Elizabeth granted him the use of a room in the Custom House. It was with the encouragement of William Camden that he began his Historie of Great Britaine, which was published in 1611. Although Speed probably had access to historical sources that are now lost to us he certainly used the work of Saxton and Norden, his work as a historian is considered mediocre and secondary in importance to his map-making, of which his most important contribution is probably his town plans, many of which provide the first visual record of the British towns they depict. A map of the Bristol Turnpike road from Langford to Redhill has been added to the Gallery section. This map has a series of numbers which relate to road widening schemes. 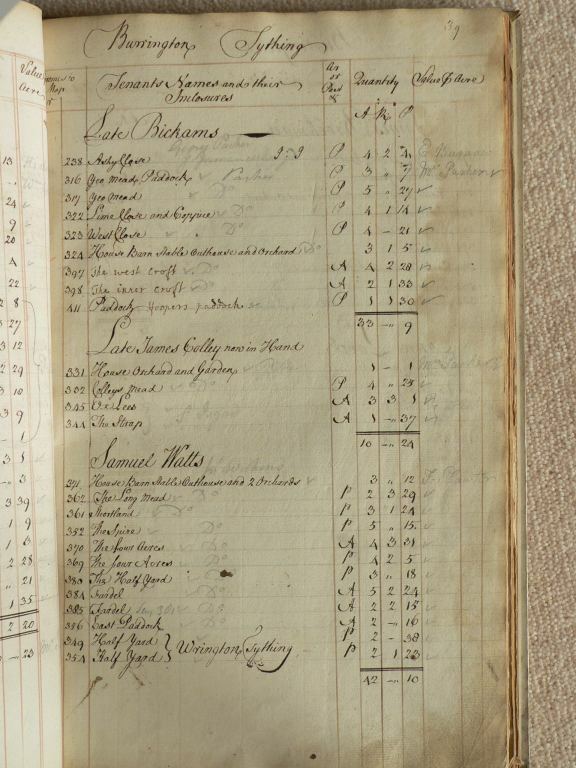 The schedule that accompanies the map, which marks the location of houses and buildings along its length is also shown in the Gallery section. Another local map that shows Langford and the surrounding area in the 18th Century is the Benjamin Donn map. This map, which is available for viewing in the Bristol Museum, is a circular one based on a 12 mile radius from the centre of Bristol. As the 12 miles comes to the Langford brook, the Burrington part of the village is covered. The map is available for viewing in the Gallery section. The earliest cartographic reference to Langford that we have found to date is that appearing in John Ogilby’s linear road map of 1675. This was entitled “Continuation of the Road from London to Bristol…Continued to Huntspil”. You can see a picture of the map in the Gallery section. Essentially the map shows the old coach route from Bristol to Exeter passing through Bridgwater approximately following the route of today’s A38. It is possible to make out Perry Bridge, and Burrington Church, and of course the ford that gave the village its name. It was, as we now know the passing of the coach route through the village of Langford, that put us on the map! The 1636 Langford Court survey has two flourishing coach inns in the village, The White Hart Inn ( now the Langford) and The Green Dragon Inn ( formerly on the site of Richmond House). More information on the Inns appears in the Research News section. Generous donations from Wrington and Burrington Parish Councils, the Mendip Society and the Langford History Group, as well as from a number of individual residents, have enabled Bristol Record Office to have two of the historic Wrington Estate Maps professionally conserved. This means that they are now available for the public to view and use. Digital images have been made of these and will soon be available to view on the website. The Gallery section has some photos taken of the maps at the Bristol Record Office (BRO). On October 21st, Alex Kolombos, chairman of the Langford History Group, presented a cheque for £918 to Talei Rounds, Archivist at the BRO. The older of the two maps was commissioned from John Rocque in 1738 by William Pulteney, who had purchased the Wrington Estate. It shows the Burrington tithing. Equivalent maps of the other two tithings, Wrington and Broadfield (Redhill), are in better condition and can also be viewed at the BRO. Unfortunately, Rocque’s map of the whole estate has deteriorated beyond repair. However, a later map of the whole estate, one commissioned in 1832 by the then Marquess of Cleveland was in better condition and was the other one to be conserved. It was drawn by J. M. Tucker of Bristol and measures approximately 4 metres by 2 metres. The schedules that accompanied these maps have survived and give a great deal of information about the owners and occupiers of each individual plot at these times. This project has been an excellent example of cooperation between parishes. It has enabled these valuable documents to be preserved for the future and made available to all those interested in local history. So, very many thanks to all who contributed. In May 2010, Stefan Marjoram took some detailed digital images of the earliest Ordnance Survey map of Churchill Parish. The survey was carried out in 1882 and 1883, and finally published in 1885. This is a particularly fine example as it has been hand painted, and covers some of the adjacent parishes of Congresbury, Sandford and Burrington. The original map is in the Memorial Hall in Ladymead Lane, and was only recently rediscovered; thanks to the efforts of Neville Lee and the Weston Mercury for recording the unveiling ! It is hoped to have the map on public view from time to time, but you will be able to study it in great detail by clicking on the link below. We are hoping to publish more maps as they become available as an aid to our readers wishing to research their neighbourhoods. John Rocque went on to map many cities including Bristol and Dublin, and in 1746 his engraving of London was considered to be the finest and most accurate of the city. He became official cartographer to the Prince of Wales in 1751. It appears that the Rocque maps ended up in the office of Bennetts, the Wrington solicitors, and they are currently housed in the Bristol Record Office (BRO). The maps are finely drawn on heavy parchment, at a scale of about 12 inches to 1 mile, and show the villages in considerable detail. Hedges, trees, orchards, houses, woodland, lanes and paths are all minutely drawn. Each enclosure is marked with a letter which identifies the tenant and a number which identifies the plot in an accompanying schedule. The schedule, pages from which can be seen below, is in the care of Mrs Joyce Smith of Wrington and has been transcribed. It gives a most invaluable insight into the inhabitants of the villages over 100 years before the first complete census and gives a name to each plot. Spreadsheets have been transcribed of the schedule and are available to view along with the maps. Notwithstanding the condition, Stefan Marjoram has recently managed painstakingly to photograph and stitch together a most remarkable digital rendition of the map. It covers the Manor of Wrington, that is Burrington and Wrington, but excludes the Manor of Langford which at this time was held by John Jones. Hence much of Lower Langford as it is today, was not covered by this survey. In addition digitised images are available of the Wrington and Broadfield tythings. The originals can also be inspected at the BRO. The maps reveal many new features of the landscape that will greatly add to the knowledge of our local villages, and will hopefully assist you in your research and studies. 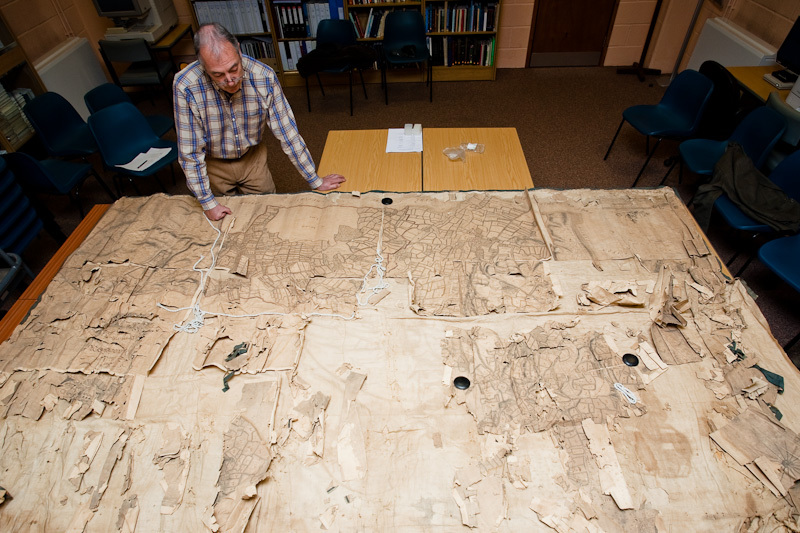 The Burrington map has darkened with age and is now encapsulated to allow it to be viewed at the Bristol Record Office without being further damaged. We are currently seeking financial help and support to have one of the John Rocque maps restored. An excellent description of these maps can be found by visiting the Links page, clicking on the “Wrington Village Records” site and going to page 39. These maps dating from 1738 represent the earliest available detailed maps of the parishes of Wrington and Burrington. 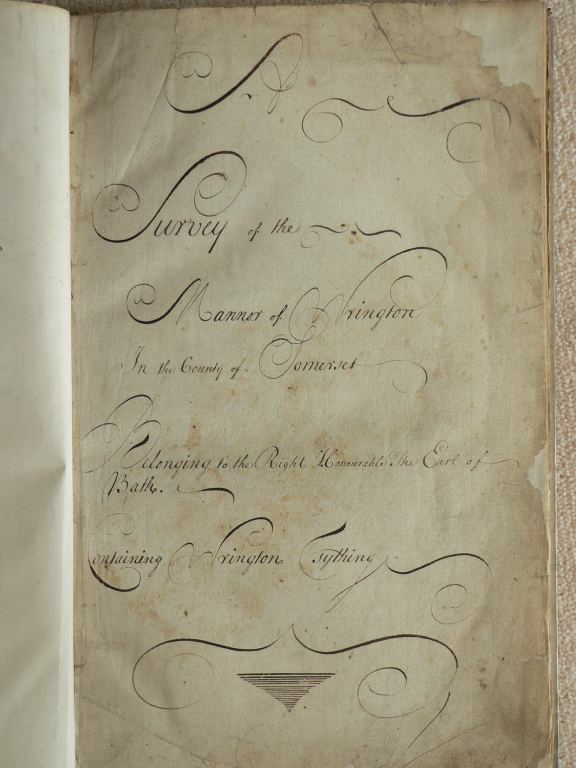 They were commissioned by the Rt Hon William Pulteney to cover surveys of the Manor of Wrington and its tithings. The maps eventually ended up at Bennett’s the solicitors in Wrington who handed them over to the Bristol Record Office (BRO) for safe keeping. A total of four maps are thought to exist. 1. 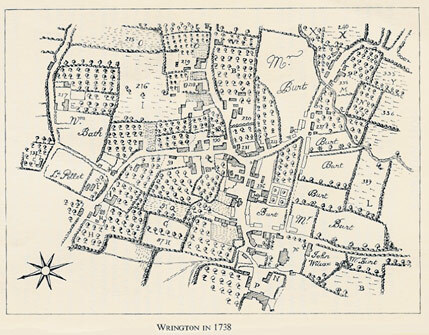 The 1739 map of the Manor of Wrington, which is in poor shape and not fit for public viewing or for restoration. See Gallery image under “John Rocque” to appreciate the condition of this map! 4. 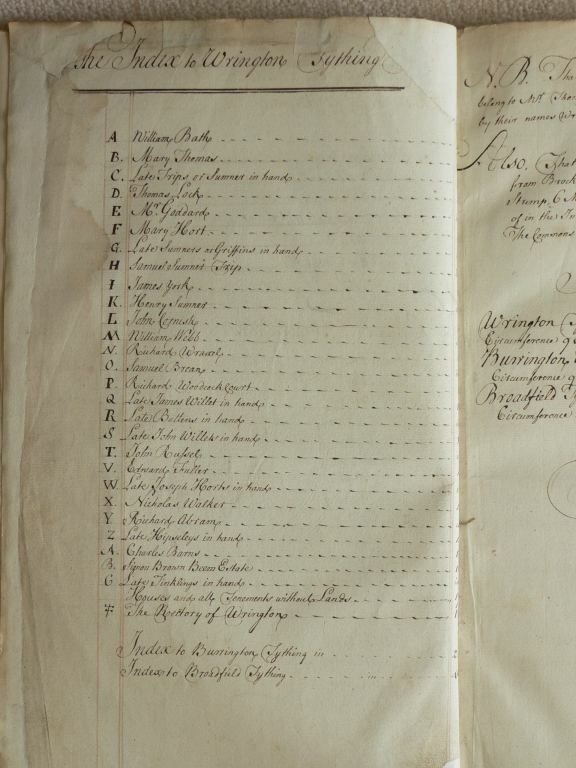 The 1738 Burrington tithing, not available for viewing but considered restorable. It is this John Rocque map that we are seeking to raise money to have restored. These maps are 100 years earlier than the tithe maps of 1838, which have been used extensively in our research and publications, and will be a valuable aid in our study of the early 18th Century development of the Wrington Vale. We are in the process of digitising the maps for inclusion on our website. John Rocque went on to map many cities including Bristol and Dublin, and in 1746 his engraving of London was considered to be the finest and most accurate of the city. He became the official cartographer of the Prince of Wales in 1751. In addition there exists another map of the Manor of Wrington dated 1832 comprising the parishes of Wrington and Burrington. This was commissioned by W.H. Vane, Marquis (later) Duke of Cleveland, who had inherited the estate, and was produced by J.M.Tucker of Bristol. This is also in poor condition and not available for public inspection. However, along with the Rocque map of Burrington, a quotation for their restoration and conservation has been obtained, and we are seeking financial support to pay for this work . In addition to a pledge from the Mendip Society, funding has also been promised from Wrington Parish Council, Burrington Parish Council and private donors. The Langford History Group is also willing to make a donation to the restoration. We hope that by the early summer the restored maps will also be available for viewing at the BRO and here on our website. Anyone wishing to help with this project, should get in touch with us. In early 2009, Stefan Marjoram took some detailed digital images of the earliest Ordnance survey map showing the parish of Burrington. The survey was carried out in 1882 and 1883, and finally published in 1885. This is a particularly fine example as it has been hand painted.